Description:Used 2006 Chevrolet TrailBlazer LS 4WD for sale - Call with 135,336 miles. 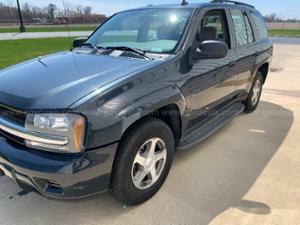 Online Auction for Government Surplus – QAL # 7470-30 - Ends 4/30/19 **PRICE REFLECTS CURRENT HIGH BID AND IS SUBJECT TO CHANGE AT ANY TIME DURING THE ONGOING AUCTION** 2006 Chevrolet TrailBlazer LS 4WD SPORT UTILITY 4-DR, 4.2L L6 DOHC 24V. Vehicle Starts, Runs, and Drives. Tires are in good condition minor dents and dings on the exterior of the vehicle and some staining of the interior. GovDeals.com is the online auction platform where you can bid on and buy government surplus.